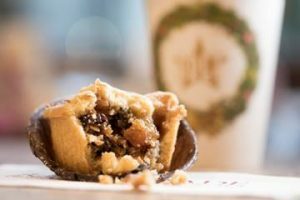 Pret A Manger’s much-loved Christmas menu has returned to stores across Hong Kong. In the spirit of the season of giving, $1 from each item sold from Pret’s Christmas menu will support Feeding Hong Kong, the first Hong Kong food bank dedicated to rescuing surplus food and redistributing it to people in need. 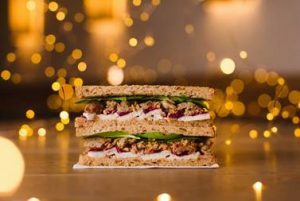 This iconic Christmas sandwich layers thick slices of turkey breast and stuffing on granary bread, with cranberry sauce, spinach, crispy onions and mayo. This deliciously comforting wrap features slices of turkey breast with emmental cheese, sweet potato falafel and cranberry sauce freshly baked in a tortilla wrap. Velvety pumpkin soup with cinnamon, carrots and onions – an indulgent winter warmer. Creamy brie with cranberry sauce, crunchy pine nuts and spinach on granary bread to wish all a veggie Christmas. 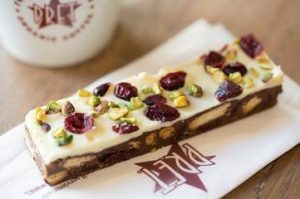 This colourful and crunchy bar features gingerbread biscuit and cranberries bound with chocolate and just a hint of orange, as well as a layering of white chocolate with more cranberries and pistachios. This award-winning festive classic, handmade in the UK by specialist bakers, are made in small batches to a traditional recipe. The mincemeat was prepared four months ago and has since been developing its flavour profile ever since. Topped with a Pret star and a dusting of icing sugar, these pies are a classic festive favourite. This delicious Christmas special mixes cranberry in smooth, Greek-style yoghurt with crispy honey nuts, dried cranberry and pumpkin seeds. 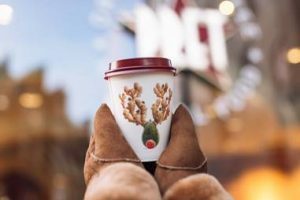 This heart-warming seasonal treat takes Pret’s classic latte and adds homemade gingerbread syrup and a dusting of cinnamon. From the sale of each Christmas menu item, $1 will be donated to Feeding Hong Kong, with donation boxes also available in store. Feeding Hong Kong is the first Hong Kong food bank dedicated to rescuing surplus food and redistributing it to people in need. Pret was the first donor to Feeding Hong Kong, and has donated HK$2,000,000 to the food bank since 2009.